One of my favorite Cape Cod vacation traditions is going to Sprout Farm for fresh vegetables. And I always pick up a sweet little bouquet when I’m there, too. Truthfully, I would rather have a bouquet of zinnias and sunflowers and marigolds than any fancy rose bouquet! You’ll be glad to know my to-do list is shrinking and I hope to bang out all of the major things I need to accomplish today. Send good thoughts and wishes! And happy weekend, friends. Love your bouquet! It’s so fresh and colorful. You’ve got this, Carole. XO The shower will be fabulous, and all will be well. Happy Friday and love the flowers and the vase seems perfect for a waterside vacation. Your shower will be a grand welcome for that new baby. My favorite bouquet is spring flowers, especially if there are tulips and iris in it. Far better than a dozen roses. Not that I would turn roses away. That is a beautiful bouquet, and I bet you’ve also got some lovely shower flowers for tomorrow. Happy Weekend! Beautiful bouquet! glad your list is shrinking. Enjoy the shower tomorrow!! Have a wonderful weekend and I’m sure you’ll be relaxing on the deck this afternoon…you are getting things done! I’ve always liked more casual bouquets, too. Have a fabulous weekend!! Good thoughts and wishes on the way. I’m with you on the flowers. Happy weekend! Agree x a million about the flowers. Those are just right. Oh the to-do list…ever growing! 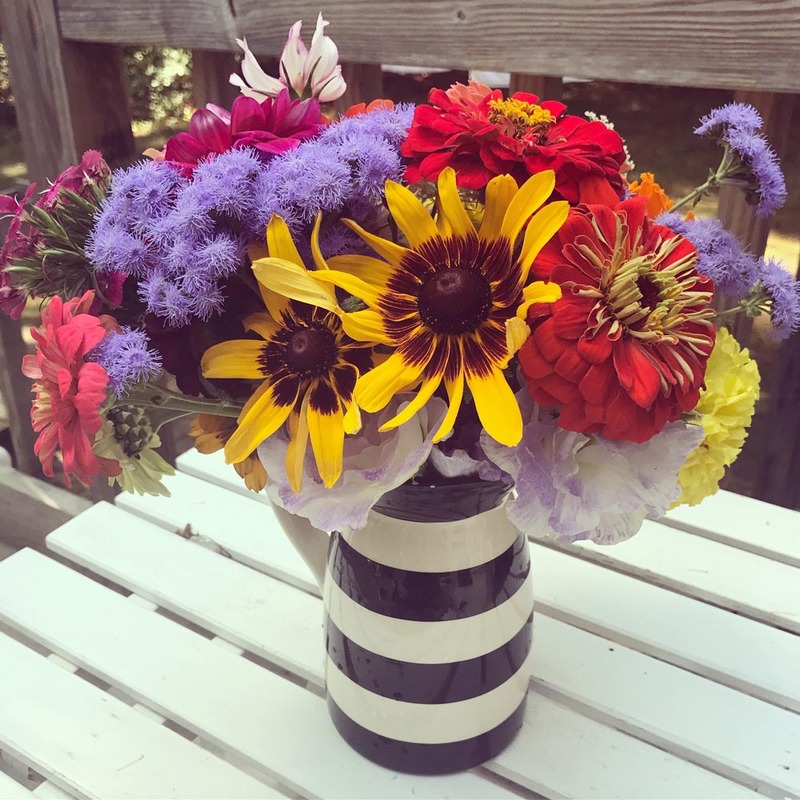 Those bright blooms are the best – I’m 100% with you about the “fancy” flowers.